Photographs do not do justice to this stunning mirror clock. The mirror dial and mirrored hands are curved into an elegant dome shape and the mirror back itself is bright silvered with contrasting tracking, to give the pattern strength and depth not found in cheaper surface printed glass. The dome is echoed by the curved corners and edges of the square clock. 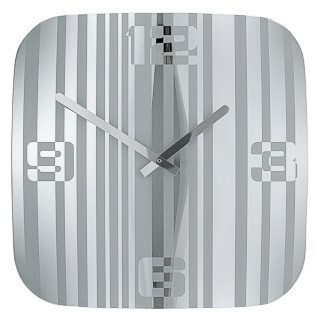 This timepiece, because of its reflective nature, will look fantastic and match any colour scheme or room design. It is 35cm square (13¾ inches approximately).